Terrifying footage has emerged of holiday makers screaming as a British driver ploughed through pedestrians while 'high on cocaine', injuring a seven-week-old baby and at least five others. 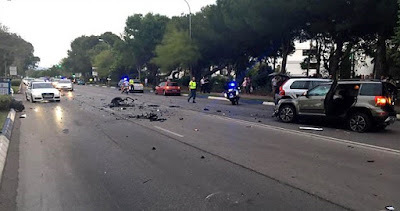 The clip captures the dramatic moment a 4x4 mows down and injures pedestrians in the holiday resort of Puerto Banus as the Audi SQ7 appears to be driven deliberately at victims. 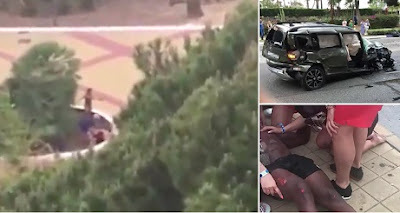 Horrified Brits caught up in the carnage can be heard screaming in panic as the vehicle screeches around a pedestrianised area near the resort's famous Ocean Club. 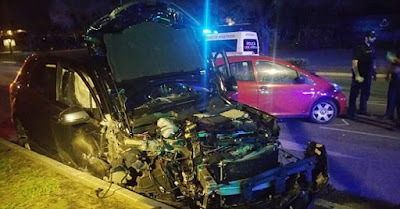 Six people were taken to hospital and the driver was arrested after crashing into vehicles having led police on a wild chase on the wrong side of the road. Well-placed sources close to the investigation said the unnamed suspect, aged 27, failed a drugs test after police initially said he had appeared drunk after being stopped by officers. The Brit driver, in his late 20s, was arrested at the scene as well as the passenger. The unnamed driver is believed to have been asked to leave the nearby Ocean Club - which was hosting its annual champagne party - after a fight. Police are now investigating whether he deliberately mounted the pavement and drove down a pedestrian area leading to the club, mowing down people in his path - including the seven-week-old baby. Officers confirmed they have arrested two Brits over last night's horrific scenes.